The Parana Delta is one of the world’s largest natural deltas and a popular day trip destination from Buenos Aires, meaning it can get busy in the summer months. Avoid the crowds on this private full-day tour and visit the affluent suburbs of Olivos and San Isidro, explore historic Tigre, and enjoy a catamaran cruise around the delta. Your tour begins with pick-up from your central Buenos Aires hotel by private vehicle. Accompanied by your local guide, take the scenic route out of the city, passing along the grand Avenida Libertador and through the idyllic Bosques de Palermo (Palermo Woods), before heading north along the coast. As you drive through the affluent towns of Buenos Aires province, stop off in Olivos to take a peek at the official residence of the President of Argentina, and the provincial town of San Isidro, renowned for its magnificent Gothic church. On arrival in Tigre, head to the port to board a catamaran cruise and glide around the scenic waterways, stilted houses, and lush islands of the Parana Delta. After your cruise, spend time exploring the lively markets of Tigre or pause for lunch (own expense) at a waterfront café, then make your way back to Buenos Aires, stopping at scenic lookout points along the way. Back in the city, your tour ends with drop-off at your hotel. I feel so fortunate that I had Patrick as my guide. He was punctual, professional, pleasant, informative-it’s difficult to say how much more I learned about the Argentine culture, politics and neighborhoods in one day than in my previous 4 with other guides/interactions. Can’t say enough good things! 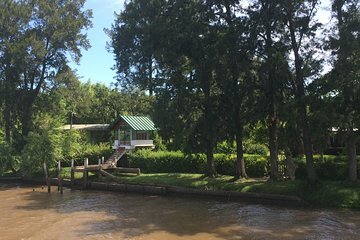 Wonderful tour of Tigre Delta and surrounding area. Patrick was very knowledgeable and told us interesting facts about the region and the houses on the riverbank. He also took us to an amusement park at the request of our five-year-old. Definitely recommended. Un lindo recorrido con un excelente Guía.